Hwy 17, from the ferry terminal at Schwartz Bay to Victoria, is a busy paved highway that passes the farmlands of the Saanich Peninsula, the Victoria Airport and several communities on it's way to the province's capital city. 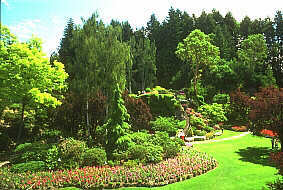 Sidney is located on the Saanich Peninsula near Schwartz Bay. The Washington State Ferries terminal for San Juan Islands and Anacortes is located in Sidney. Explore the park's beaches, meadows and forests which are home to wildlife such as eagles, herons, waterfowl and fallow deer. Access is via a foot-passenger ferry from the Sidney Island Beacon Street Marina. Continuing south along Hwy 17 towards Victoria, visitors will pass the exits to the International Airport, provincial parks and historical sites. With its impressive beaches, great swimming and watersports this is the easily the most popular park in the Greater Victoria area. There are good walking trails. Visitors are often treated to rowing competitions and training. 26km (16.1mi) south of Swartz Bay, is McKenzie Avenue, the Island's largest interchange. Downtown Victoria start here. Just west leads to Hwy 1 (Island Hwy). East takes you to Swan Lake and the University of Victoria (UVic). Tours of this beautiful university campus are available. Enjoy the walking and jogging trails and flower gardens. Hwy 17A, also known as West Saanich Road is located near the ferry terminal. Turn west at Wain Road; this 24km (15mile) drive takes you to Royal Oak Drive, just north of Victoria, where Hwy 17A joins Hwy 17. Along Hwy 17A is Patricia Bay where visitors may walk the beach and view wildlife and waterfowl. Continue on past Brentwood Bay, a small, quaint community where you will find the Brentwood-Mill Bay Ferry which crosses Saanich Inlet to Mill Bay. One of BC's premiere attractions. This once limestone quarry is now extensive gardens which attract tourists from around the world. 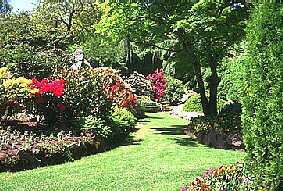 Overlooking Tod Inlet, the gardens feature native flowers, exotic shrubs, trees and flowers. Visit this observatory on a clear night; located on Little Saanich Mountain.